One of the most annoying experiences online is getting hit for months with ads for something you already bought. Advertisers hate this problem, too, but theyâ€™re often ineffective in preventing it. In a June survey of 82 senior marketing executives worldwide conducted by The CMO Club and Thunder, 78% of respondents said it is â€œinexcusableâ€� for consumers to keep receiving ads for products they already bought. However, 60% were not confident in the accuracy of the reports they receive on ad frequency. Without really knowing how many times people are seeing a given ad, itâ€™s difficult to prevent a user from seeing an ad too many times, or even worseâ€”from seeing ads for stuff they just bought. Advertisers are attuned to this problem. 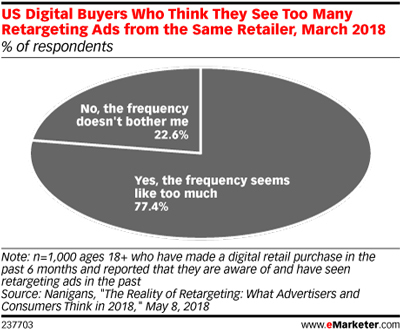 More than three-fourths of the 1,000 US digital ad buyers surveyed by Nanigans in March said they see too many retargeting ads from the same retailer. One extreme solution to solving this problem is for advertisers to stop retargeting ads. 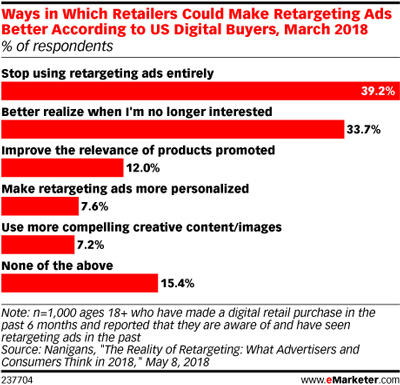 Nanigans found that roughly 39% of digital buyers believe this is the best approach for improving ad retargeting. Copyright 2018 eMarketer inc. All rights reserved. From https://www.emarketer.com. By Ross Benes.